Dry hopping is a great way to enhance the hoppy aroma of your home brewed beer. Real hopheads will tell you that in addition to boil and late hop additions, adding dry hops is a preferred technique for preserving a burst of delicate hop aroma for IPAs and other hoppy beers. Hops are normally added during the boil to extract alpha acids that provide the bitter flavor needed to offset sweet barley malt in beer. Brewers also use late hop additions in the last 5-10 minutes of the boil to enhance aroma, but even this technique loses some aromatic oils that evaporate rapidly in the boil. Dry hopping involves adding hops to the fermenter or keg after fermentation. Dry hops add no bitterness to the beer, but the technique does add fragile aromatic oils that are normally lost in the boiling process. Dry hops are allowed to soak in the finished beer for anywhere from several days to several weeks. The result is a burst of hoppy aroma. Commercial craft brewers use dry hopping to enhance their beer including Anchor Liberty, Samuel Adams Pale Ale and Sierra Nevada celebration. Many drinkers prefer the distinctly floral hop aroma that dry hopping adds. 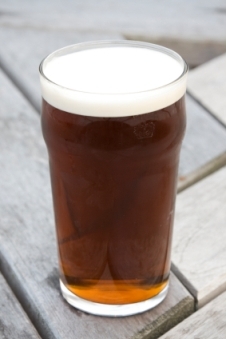 On the con side, some drinkers perceive a “grassy” or “oily” flavor from dry hopping. The technique is appropriate for brewing beer styles with high hop rates such as IPAs, Pale Ales, some Stouts and California Common (Steam) beer. The first question that arises when dry hopping is which hops to use? Aromatic hops with low alpha rates (6% or less) are considered preferable because these hops have a higher percentage of fragile aromatic hop oils needed for dry hopping. All of the noble hops as well as most of the low alpha aromatic varieties are appropriate. Examples include: Saaz, Tettnanger, Hallertauer, Goldings, Fuggles, Cascade and Williamette. You should select a hops that matches the origin and beer style – an English Goldings hops might be appropriate for an English Ale or India Pale Ale for instance. The next question is what form of hops to use: pellets, plugs or whole hops? Plug or pellet hops are generally preferred, especially for those using a glass carboy with a narrow neck. Getting whole hops in and out of the fermenter can be difficult. Pellet hops can cause some foaming when adding because, much like diet coke and mentos, the pellets have a large surface area that promotes nucleation of the CO2 left from fermentation. Some purists prefer plug hops as they fear that the extra processing and compression of pellet hops may have an effect on the delicate hop oils and aroma. Personally I have noticed no significant difference between plug and pellet hops when dry hopping. The amount of hops to use is largely a matter of preference. Between 1 and 2 oz (28-55g) per 5 gallons (19 L) is considered a moderate amount. Less can certainly be used if you are shooting for a mild floral aromatic, and true hopheads use as much as 4 oz of hops for 5 gallons for a burst of aroma. When should one add hops to the beer, and for how long? Some brewers add dry hops during primary fermentation, but most agree this can result in loss of precious hop aromas due to the steady stream of CO2 bubbling out of the fermenter. The appropriate time to add dry hops is after primary fermentation has completed. Adding dry hops to the secondary maximizes the exposure without risking volatile aromas. A third option is to add dry hops directly to the keg, but this can result in some “grassy” flavors from overexposure as the hops may remain in the keg for months. Some brewers use a mesh bag to make it easier to contain the hops and make them easier to separate from the beer later. Others merely separate the beer from hops carefully when siphoning later. Pellets tend to sink after a while, while whole hops and plugs tend to float. Obviously a bag is required for kegging your hops to keep the hops from plugging the keg. The duration of dry hopping also varies widely. An exposure of several days is the minimum needed to extract aromatic oils. Most brewers dry hop for around 3 days. Those that add hops to a keg may leave the hops in contact with the beer for months. Some fear overexposure will add a “grassy” flavor, but I’ve never had a significant problem with this. However, current thinking is that you should avoid extended dry hop periods. In these hop starved times, dry hopping has become a bit of a luxury, but an extra ounce or two added to the secondary can add a great burst of flavor for IPAs and other hoppy styles. Thanks again for visiting the BeerSmith Home Brewing Blog. Have a great brewing week. Hi What you think about use that hops together for dry hopping? Great information, my IPA is currently cold crashing and I will be adding 45g Citra dry hops for 3 days just as you have stated. Can I dry of a lager to get more aroma I was thinking Citra hops?